My husband loves football. He has juggled several fantasy teams over the last few years, and loves the big game every February (it is in February, right?). Yes, I had to check. Because I’m not a big football fan. I do love the new commercials, though. And the food. I love food. And opportunities to try new recipes. 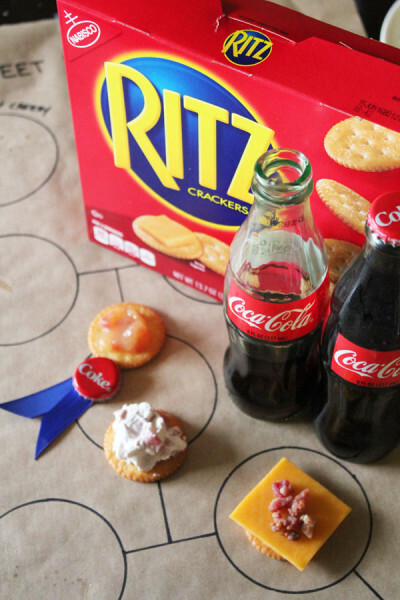 Today I’m sharing eight recipes with you, perfect for topping RITZ® Crackers. Yup, eight. Four savory recipes, and four sweet recipes. And we had a little tasting party to decide the winner. Which was hard. Because they are all seriously delicious, y’all. I know a recipe has captured my tastebuds when the leftovers are calling to me from the fridge. And these are. All of them. So let me share… feel free to thank me in the comments! 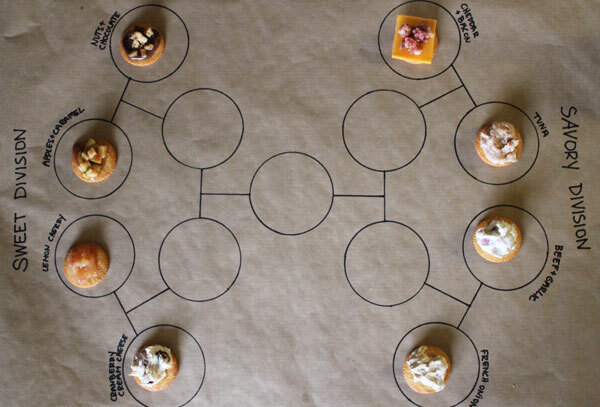 The toppings are divided into two divisions. The Sweet division and the Savory Division. On the sweet side, we have Cranberry Cream Cheese, Cherry Lemon, Caramel Apple, and Chocolate Nut. Yum-oh! Representing savory, we have Cheddar & Bacon, Tuna, Beef & Garlic, and French Onion. Oh, yeah! And they’re all easy to put together. Here are the recipes – feel free to double (triple… quadruple…) for larger crowds and serious snackers. With a fork, combine cream cheese, cranberries, and honey until thoroughly mix. Spread 1-2 teaspoons full onto each RITZ® Cracker. Mix lemon curd and chopped cherries until well mixed. Spread 1 teaspoon full onto each RITZ® Cracker. Melt caramels in microwave at 10 second intervals until melted, stirring between each interval. Mix in chopped apples. 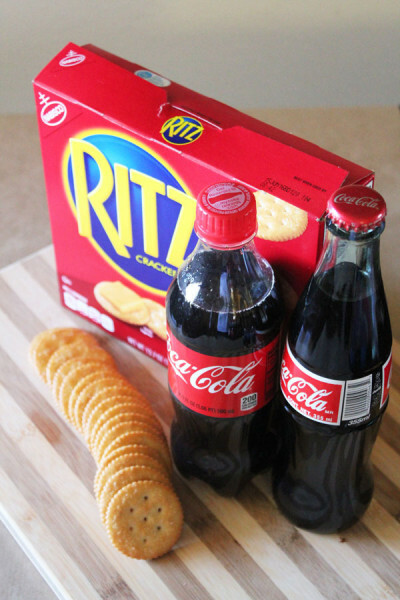 Put 1 tsp topping on each RITZ® Cracker. Spread approx 1 tsp chocolate hazelnut spread onto each RITZ® Cracker. Sprinkle with Walnuts. That’s the sweet lineup. You might think there are some crazy combinations in there, and you would be right – crazy good! 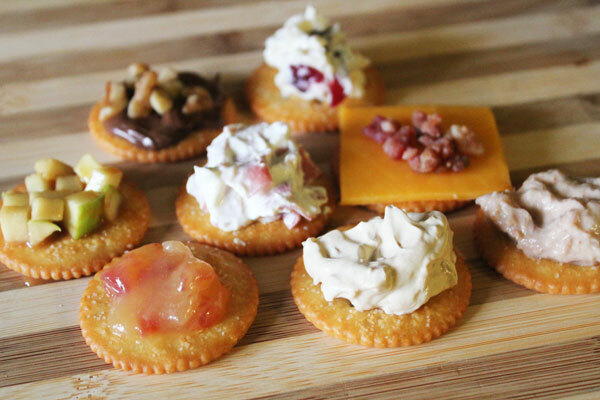 You’re going to have such a hard time deciding which RITZ® Cracker topping wins the sweet division. Ready for the savory toppings? Here we go! Place 1 square of cheddar cheese onto each RITZ® Cracker. Top with bacon crumbles. Make sure tuna fish is well drained. Mix with other ingredients until combined. Put 1 tsp on each RITZ® Cracker. Mix together ingredients until well combined. Best if made a day ahead, and refrigerated overnight. Put 1 teaspoon of mix onto each RITZ® Cracker. Mix together Sour Cream and French Onion soup mix until well combined. Best if made a day ahead, and refrigerated overnight. Put 1 teaspoon of mix onto each RITZ® Crackers. While you’re putting together your shopping list, be sure to add Coca-Cola. As you try out all these snacks, you’re going to need a palette cleanser. And what better than some ice cold Coca-Colas, right? I found my RITZ® Crackers and Coca-Cola at my local Vons. I set up a snack bracket on kraft paper so that we could keep track of our winners. The Sweet Division is lined up on one side, and the Savory Division is ready to go on the other. We started snacking, deciding winners in each match-up. 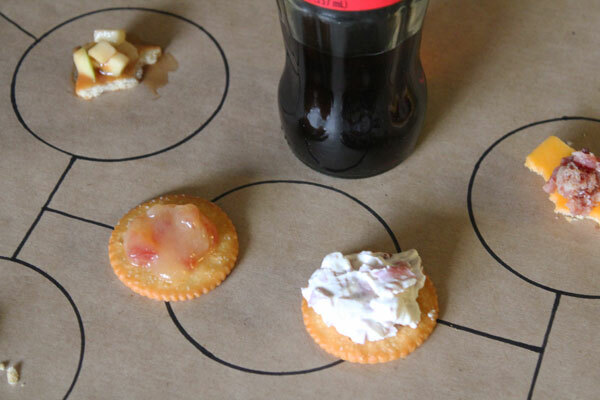 When we got to the final showdown of the RITZ® Cracker toppings, it was underdog Cherry Lemon against family favorite Beef & Garlic. How do you choose? 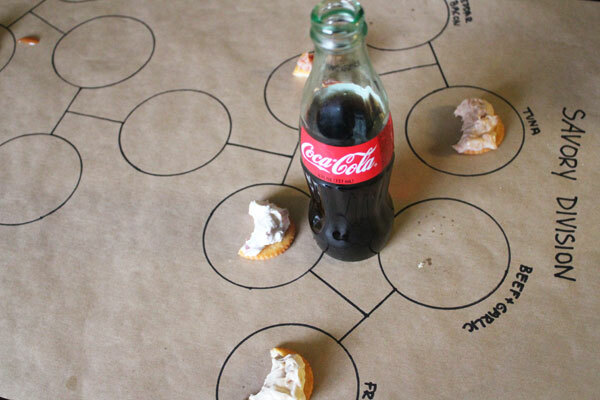 I’m not telling you which cracker topping got to bring home the Coca-Cola bottle cap prize, you’ll have to try your own snack bracket challenge this halftime. Let your friends and family decide which snack stands above all the others. 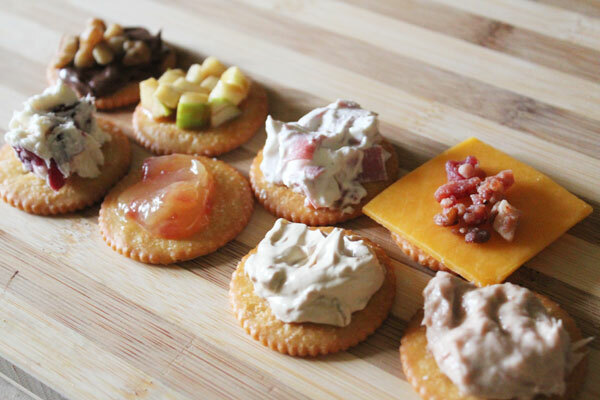 Each of these RITZ® Cracker toppings can be whipped up in only a few minutes, so you can easily prepare them the day before the game yourself, or you can challenge your friends to bring their recipes (or try one of these) for your own halftime snack challenge. 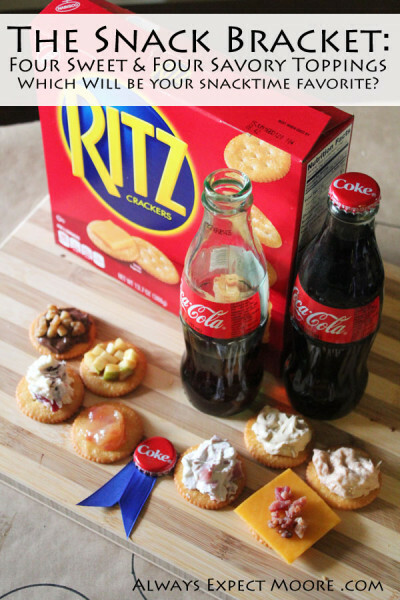 Be sure to check out these other amazing RITZ Cracker recipes, and while you’re at it, make sure you check out these awesome recipes too. 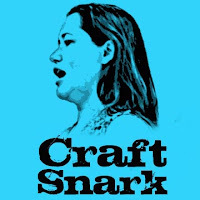 I went to a fun retreat with some crafty gal friends, and had a chance to cook. 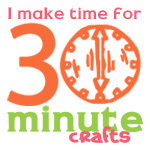 I love to craft and sew. But I also love to cook. And to bake. We had these fabulous cherries provided by the Cherry Man. I just new they needed to be baked up into a delicious treat. 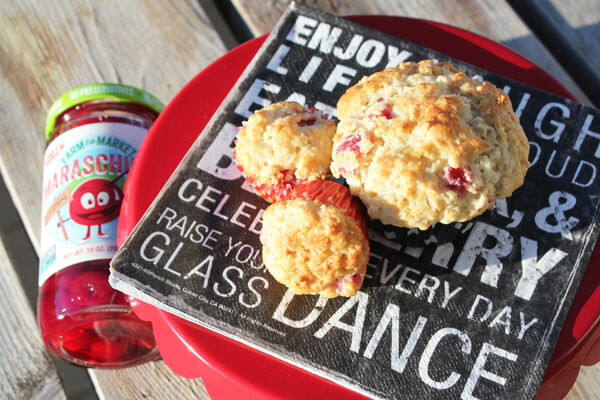 And these Cherry Almond Oatmeal Muffins were the perfect thing. The cherries add the perfect hit of sweetness, while the oatmeal makes them both tender and hearty. If you’ve never made anything like these before, you’ll fall in love! Combine wet ingredients in a second bowl. Using a spatula, mix wet and dry until incorporated – it will be lumpy, do NOT overmix!! 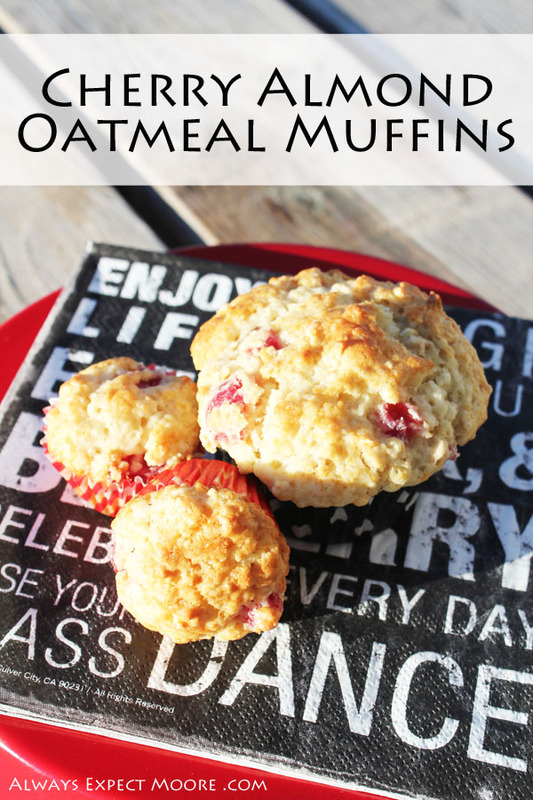 Fill muffin tins and bake for 15 minutes. Allow to cool and enjoy your cherry-almond oatmeal muffins. They really are yummy! We were at Laura Kelly’s house, and she always has fun with presentation… so she and some of the gals created these fun cherry-themed place settings. Looking for a fun recipe for a birthday, New Year’s Day, or other special occasion? These Funfetti Waffles are perfect! 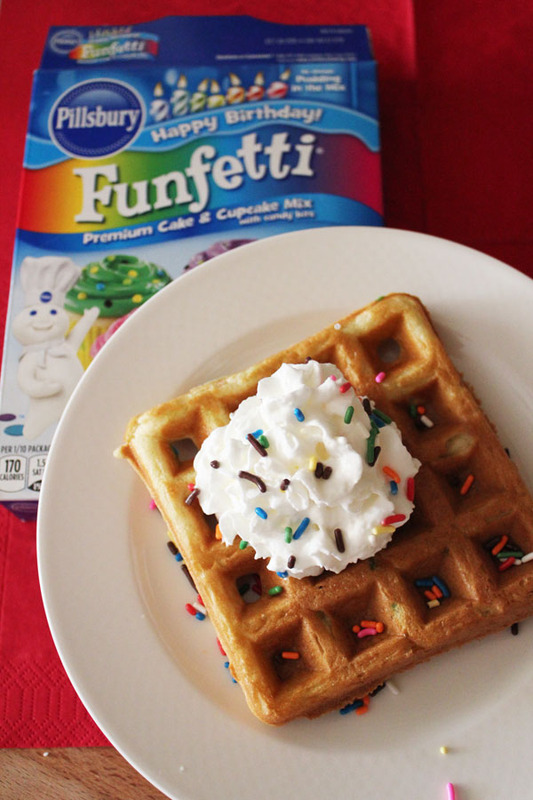 It took me a couple tries to perfect this Funfetti Waffle recipe, but now it is perfect – fluffy waffles with the perfect amount of sweetness. Great with syrup and butter, whipped cream, or just on their own! They are actually made using Funfetti cake mix, which give them a sweet flavor, and add fun sprinkles of color throughout the batter. I wish I could say that I came up with this idea out of sheer genius… but it was actually sheer desperation! I had promised my boys that I would make waffles for breakfast, then discovered we didn’t have enough flour. 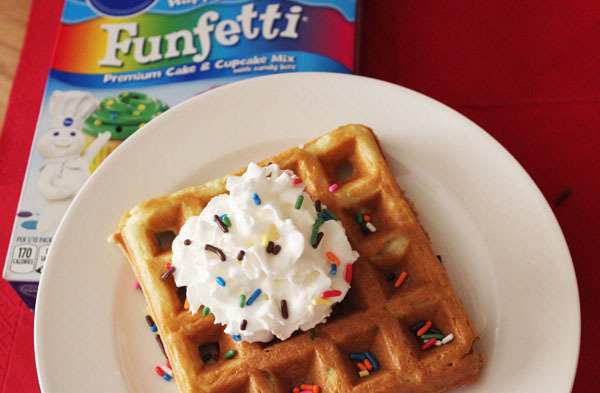 I searched through the kitchen cabinets to find something that might work as a flour-substitute… and found the perfect solution in a box of Funfetti cake mix! The boys immediately declared my Funfetti waffles to be the “best waffles ever!” Though, the first batch was much to dough-y. It took a little tweaking to find a recipe that I was happy with – but the boys didn’t mind being my taste-testers. 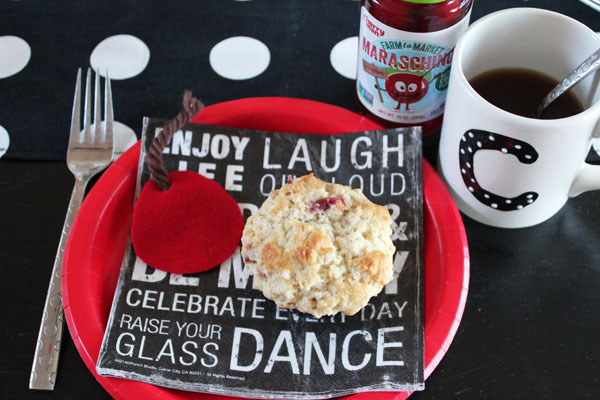 These picky eaters declared each batch to be awesome! 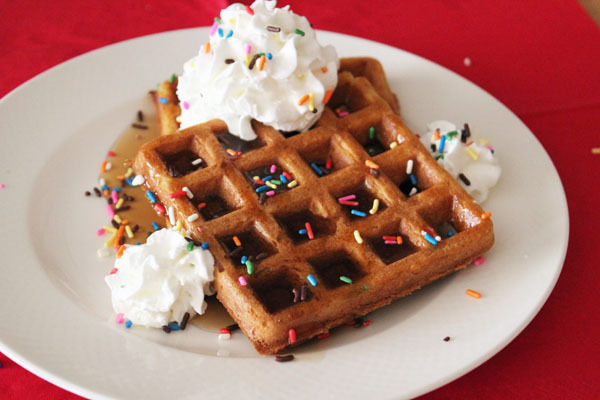 I served my waffles up with syrup, whipped cream, and sprinkles, but you can serve yours however you like. If you’re making these for a birthday breakfast, you might want to add a layer of frosting (maple buttercream, perhaps?) You can add a candle or two if you like to celebrate. 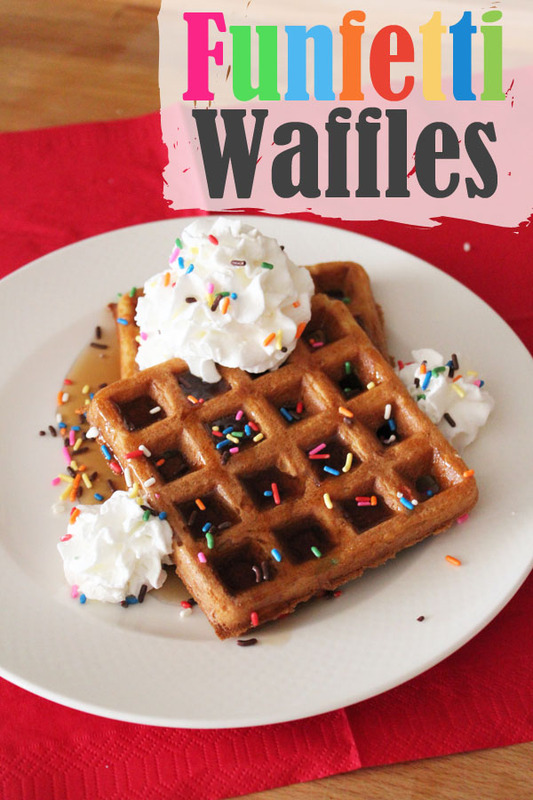 We have a small family of 4, so there were plenty of waffles to store in the freezer for future breakfasts – an awesome, quick breakfast that the kids look forward to! Not the healthiest… but they keep in the freezer for weeks, so I’m not worried about them getting a sugar overload! Mix all ingredients together until thoroughly mixed. Don’t worry about a few small lumps. Scoop batter onto a hot waffle iron, and bake until browned. Remove carefully using tongs and spatula – waffle may be soft, will crisp as it cools. I hope you enjoy these waffles – they are a breakfast favorite around here… and I’m sure they will be a Birthday Breakfast tradition! Summer is in full swing! For me, this means lots of time in the sun, and of course, grilling! We love grilling meats around here, and one of our favorite things to throw on the grill is a great burger. 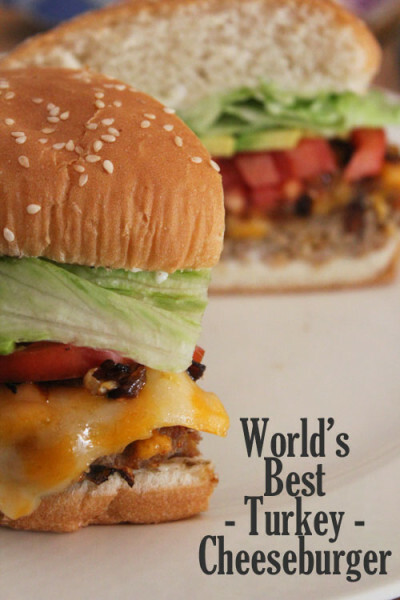 I’m a fan of turkey burgers, which are easy to add tons of flavor to! I set out to make the World’s Best Turkey Cheeseburger, so I headed to Walmart to pick up my ingredients. While I was shopping, I used the Blippar App. 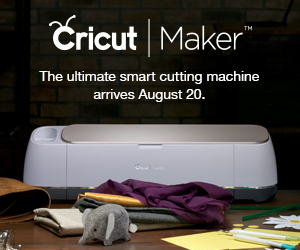 It is a fun, free app that gives you bonus information on participating products. 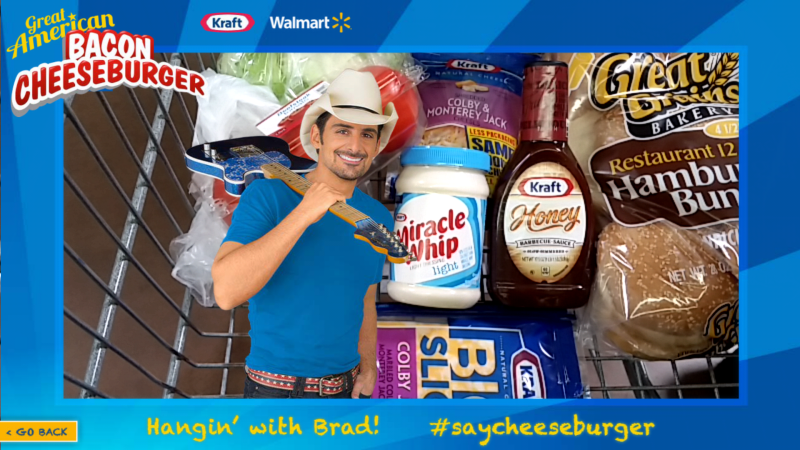 When I scanned my Kraft cheese, I had access to some great cheeseburger recipes, and I could take a photo with Brad Paisley! Hey look! Brad Paisley is shopping with me! You can also register to get Paisely Points and win some sweet Brad Paisley Swag. Then I headed home to make some cheeseburgers. Yum! You can find the full recipe at the bottom of this post. 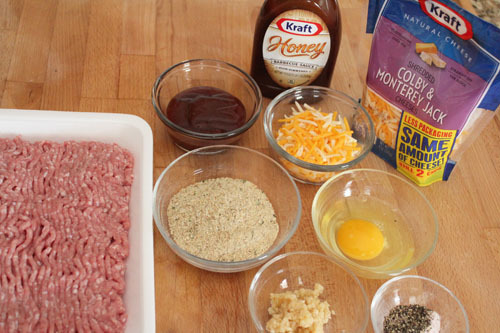 My burger patties included the basics – ground turkey, salt and pepper, egg and breadcrumbs (as binding agents), and then lots of flavor – I added Kraft Barbeque sauce, Kraft Cheese shreds, and minced garlic – yum! Everything was tossed into a bowl, and thoroughly mixed. I pulled off my rings, washed my hands, and mixed it all in with my hands. Once my meat was mixed, I divided it into 4 sections for my patties. You could also make 6 smaller patties. Each section was first rolled into a ball, then pressed flat. 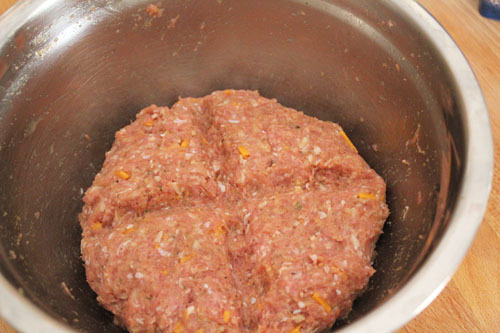 To keep your patties from puffing up into meatballs on the grill, make a crater in the center of the burger. This way, the burger will be an even thickness when cooked. 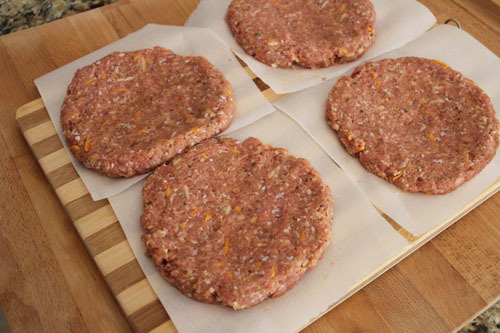 I put the patties onto squares of parchment paper, making them easy to transfer to the grill. This also makes them easy to stack in a container if you’re taking them to the park or to the beach to grill. While the burgers were grilling, I prepared my fixings. 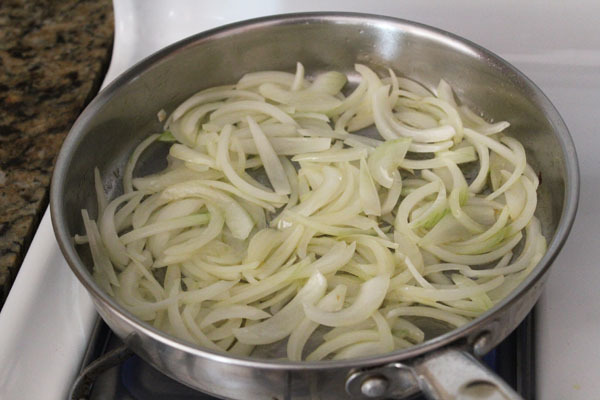 First I chopped up some onions to caramelize. 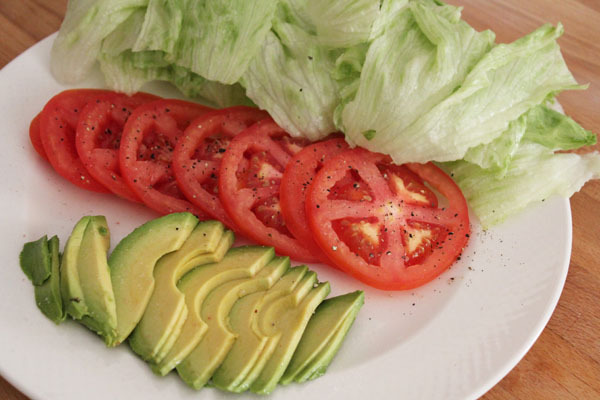 Then I chopped up my avocado and tomato. Tear the lettuce to prevent the edges from browning. I like a little salt on my avocado and pepper on my tomatoes. And then build the burger! 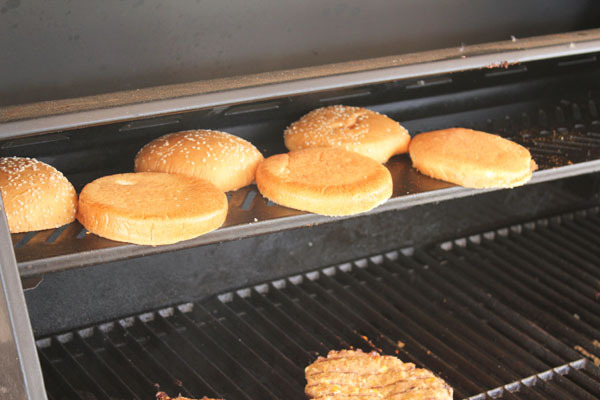 Some people like to put the cheese on their cheeseburger while it is still on the grill. I like to put the cheese on RIGHT after it comes off the grill. It still gets melty, and none of it gets lost to the flames. To make it a little easier to eat, I cut my cheeseburger in half. Hey, look who is hanging out in my cheeseburger! 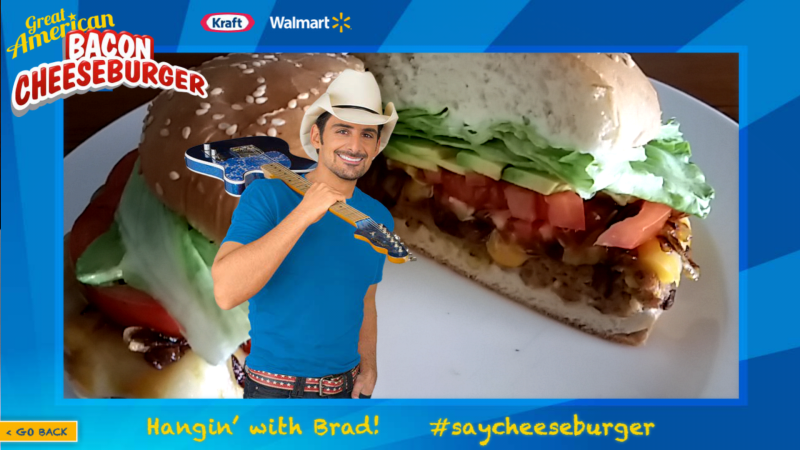 Why yes, I’ll have my cheeseburger with a side of Brad Paisely, thankyouverymuch. 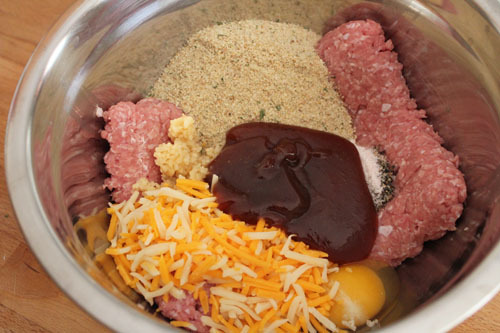 Mix all ingredients in a bowl until thoroughly combined. Divide into 4 large patties or 6 small patties. Grill until done. 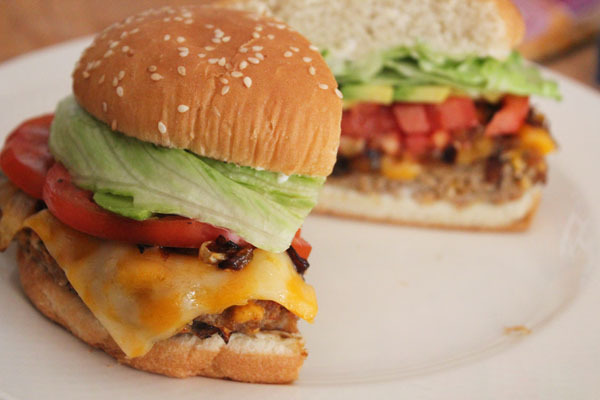 Add Kraft naturals cheese slices, and your choice of fixings on a toasted bun, and enjoy! This Slow Cooker BBQ Chicken Sandwich Recipe is one of my go-to meals. 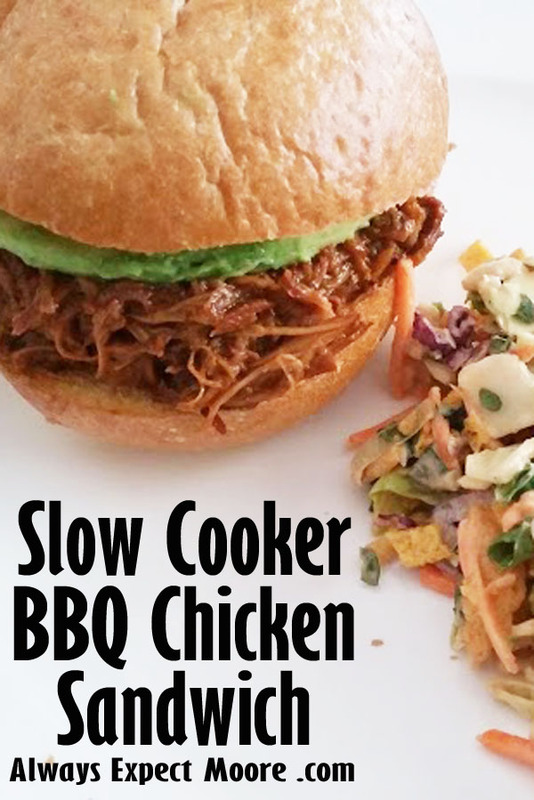 Paired with a chopped salad, it is an easy weeknight favorite. I use chicken thighs, which are both inexpensive, and delicious (helloooo dark meat!). I can toss it in the crock pot in about 10 minutes on my way out the door, and when I get back from carpool and errands, dinner is already halfway done! Sometimes I serve the sandwiches on plain buns, but if I have a little time, I like to up the ante with garlic buns and slices of avocado. Because avocado is like little green slices of heaven. Yum. Put your Chicken thighs in the crock pot. Add about 1/2 a bottle of BBQ sauce, then enough apple juice to barely cover the chicken. Cook on high for 4-5 hours. When the chicken is done, use a spoon to remove as much of the fat as you can from the top. Then shred the chicken. Two forks works well, but I have found that mashing the chicken with a hand-held potato masher works really well, and is much faster. To make your garlic rolls, spread about 1tbsp butter on the inside of each roll, then top with 1tbsp garlic, spread out. Place rolls in the oven at 350 degrees for about 5 minutes, until the rolls are starting to brown up just slightly. 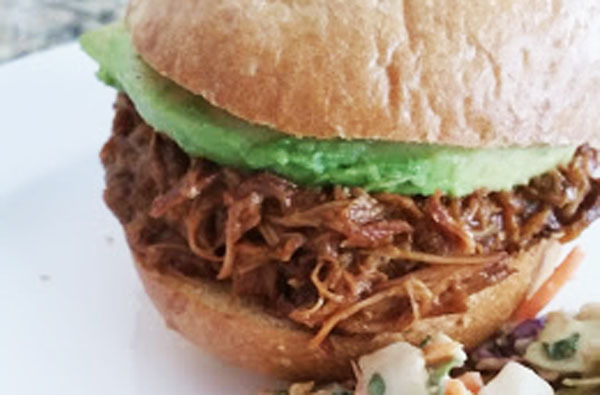 Pile your roll high with chicken, top with avocado, and serve with the sides of your choice. These are the easiest ever deviled eggs to make, and I always get compliments on them! There are tons of complicated deviled egg recipes out there, and I’m sure they are delicious. This 3 ingredient deviled egg recipe is my go-to. My favorite. And super, super simple. You need mayonnaise – I’ve used different brands and they are all fine. 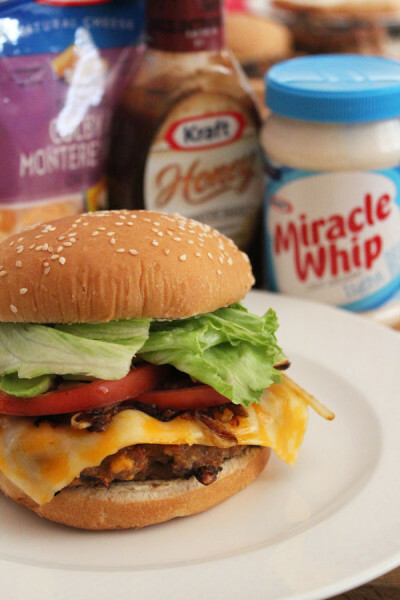 You can even use Miracle Whip if you’re a Miracle Whip fan. And of course you need hard-boiled eggs. But the most important ingredient is Season All. I’ve used different kinds of seasoning salt, but Morton’s (the one with the blue cap) is hands-down the best for this recipe. Peel your hard boiled eggs. Make sure to get all that skin off – the membrane between the shell and the egg has a terrible texture and slightly bitter taste that completely ruins deviled eggs for me, so I always make sure to dunk the eggs in water after peeling and look carefully to make sure all the skin is gone. Slice the eggs in half, lengthwise. Remove the yolks, put in a bowl. 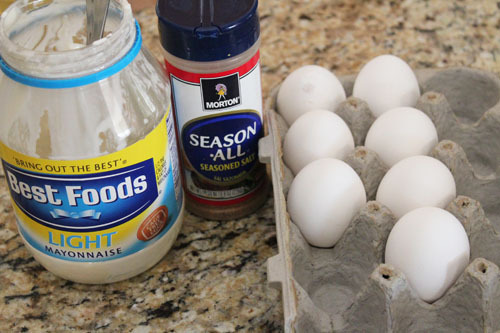 For 6 eggs, add two heaping tablespoons of mayo, and 1 teaspoon of seasoning salt. Mix thoroughly. Plop a scoop of the filling back into each cavity left by removing the yolk. You can use fancy methods like a piping bag or cutting the corner off a ziplock bag… but when I’m making these just for my family, I use two teaspoons to transfer the filling onto the eggs. Once the eggs are filled, sprinkle with a little more seasoning salt, and enjoy! You can adjust the recipe to suit your taste – add more or less mayo, and more or less seasoning salt, depending on how you like your eggs. I’ve made these so often that I don’t even measure out the ingredients anymore… I just toss it all in a bowl until it tastes right! 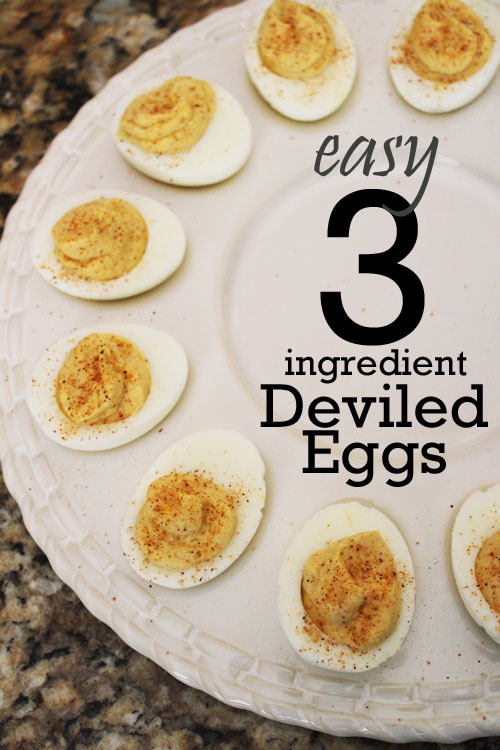 … and these easy deviled eggs always taste right!! This Holiday season, we’re staying at home. I have let my family and in-laws know that they are all welcome at our house… but we don’t plan to do any holiday traveling. We traveled last December, and we’ve done a lot of traveling this year for family parties and events. Now, we get to enjoy some time at home. Which is perfect for me, because I love Holiday entertaining. I love dressing up our home, and welcoming guests. I love cooking and preparing delicious treats. 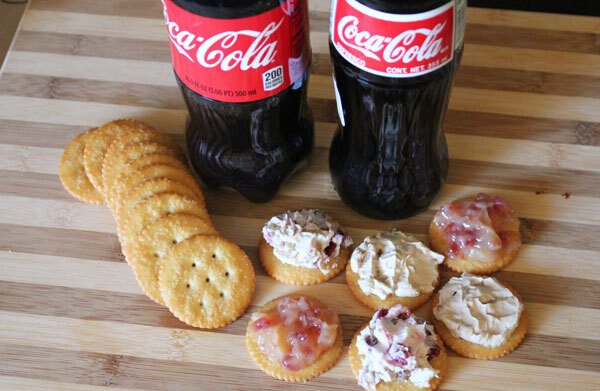 This holiday, with the help of Smart & Final, I thought I’d come up with a sweet twist on drinks and appetizers. 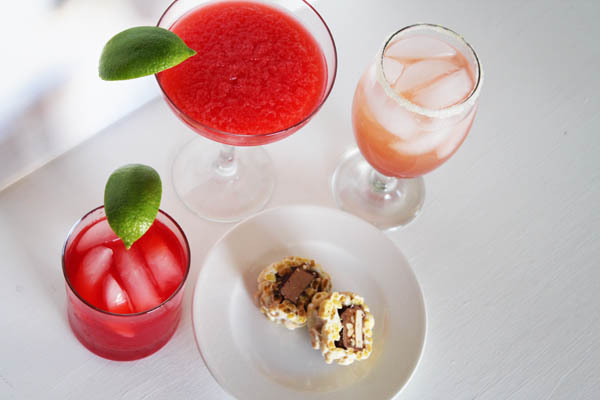 Instead of traditional drinks and savory appetizers, I came up with some sweet candy sushi and drinks that use Country Time Lemonade and Kool Aid as the base. 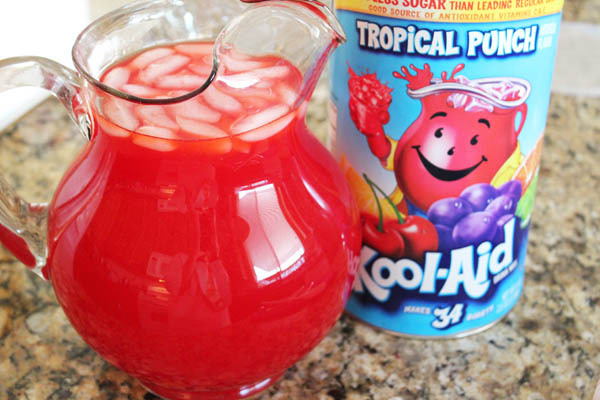 But don’t let the Kool Aid and Lemonade fool you… these drinks have kick! I started by making the Candy Bar Rolls and Starburst Nigiri. For my “sushi”, instead of rice I used Cheerio treats. Melt the butter in a nonstick saucepan on med heat. Add marshmallows. Stir until melted together. Add Cheerios, and stir until fully combined. Tip: to keep everything from sticking to your spoon, spray your spoon with non-stick spray. 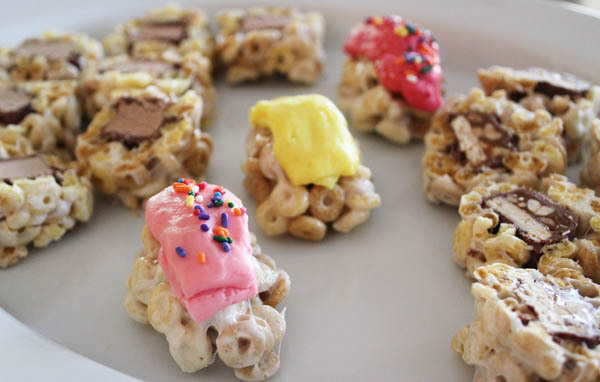 To turn the Cheerio treats into candy sushi, pour half of the still hot Cheerio treat mixture on a piece of aluminum foil, sprayed with non-stick spray. Use your spoon to spread it out into a large rectangle. Place two candy bars (with wrappers removed, of course) down on the middle of the rectangle of cheerio treats. Fold in the sides of the foil so that the Cheerio treats encircle the candy bars. Roll the treats in the foil to even them out around the candy bars. 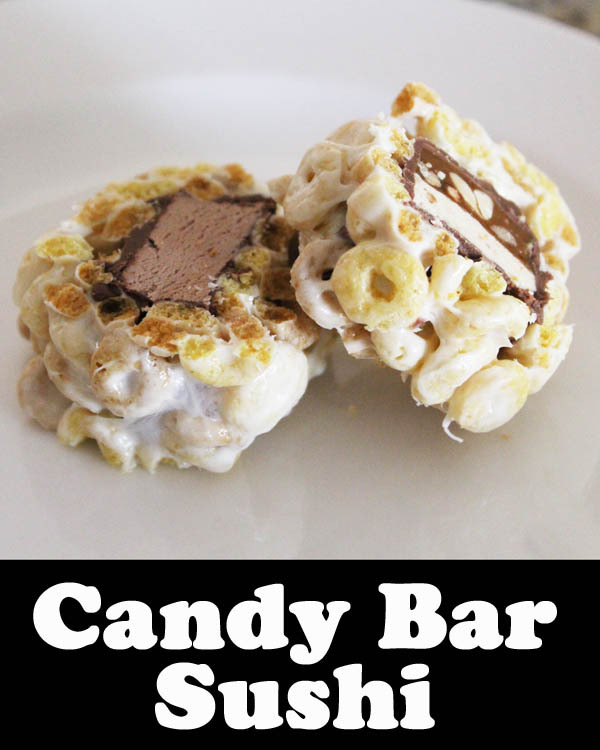 You’ll feel them melting into the chocolate coating on the candy bars a little. That’s fine. Remove from the foil and set aside to cool. Repeat with the second half of Cheerio treats and two more candy bars. You can use the same piece of foil, and no need to re-spray with no-stick spray. There will be enough left on the foil. 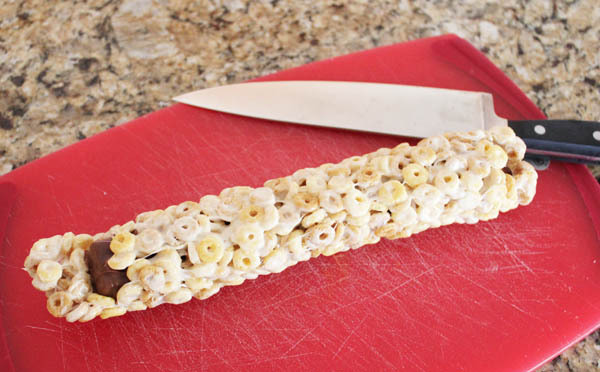 Once the Cheerio treats cool, cut into pieces about 1″ wide with a SHARP knife. Make a batch of Cheerio treats, just like before. Make tablespoon-sized balls of treats on foil. Make sure to spray both your spoons and foil with non-stick spray. Put 3 starburst in the microwave. Times will vary based on your microwave, but mine took about 10 seconds. You want them slightly softened, NOT melted. Pull the warm Starburst into the shape of a slice of raw fish, and set on top of your cereal treat “rice ball”. Dip in sprinkles if you like. As long as I was giving Cheerios and candy bars a more “mature” look in the form of candy sushi, I thought I’d give CountryTime lemonade and Kool Aid a makeover. Because what is more welcoming after a long drive than a refreshing drink? I made a Kool-Aid a-rita. 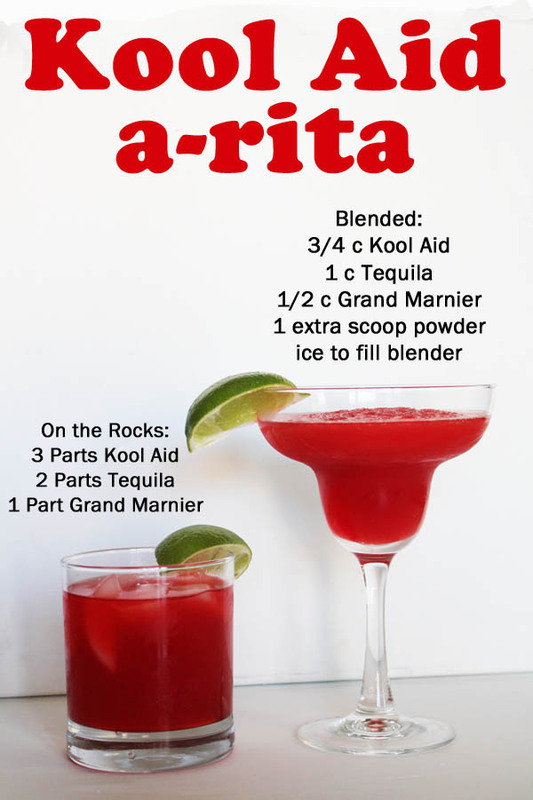 Which is the delicious love-child of a Margarita and Kool-Aid. 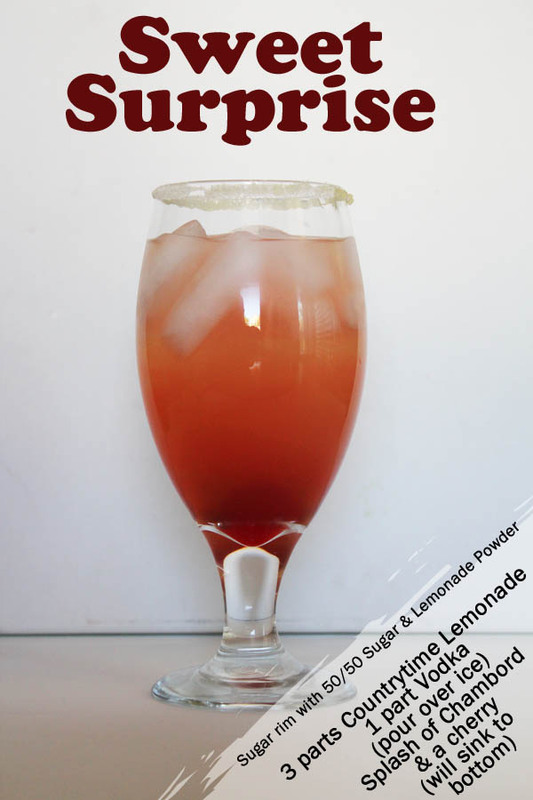 You can make it on the rocks or blended, the recipe changes a little based on how you want to serve it. Shake and serve over ice. Garnish with a slice of lime. Fill blender with ice, blend until smooth. Garnish with a slice of lime. The surprise is the cherry at the bottom of the drink. 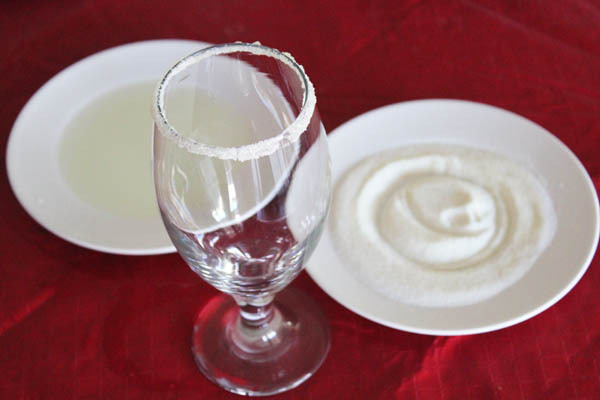 Mix a tablespoon of sugar and a tablespoon of the lemonade mix together on a small plate. On a second plate, pour a little of the prepared lemonade. Dip the rim of the glass into the lemonade. Let the excess drip off. Then dip into the sugar mixture. It is that easy! Holiday entertaining has never been as sweet! Oh – and keep a pitcher of un-spiked Kool-Aid and Lemonade around for your under-21 houseguests! 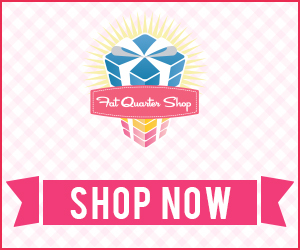 And right now there is a great promotion going on! 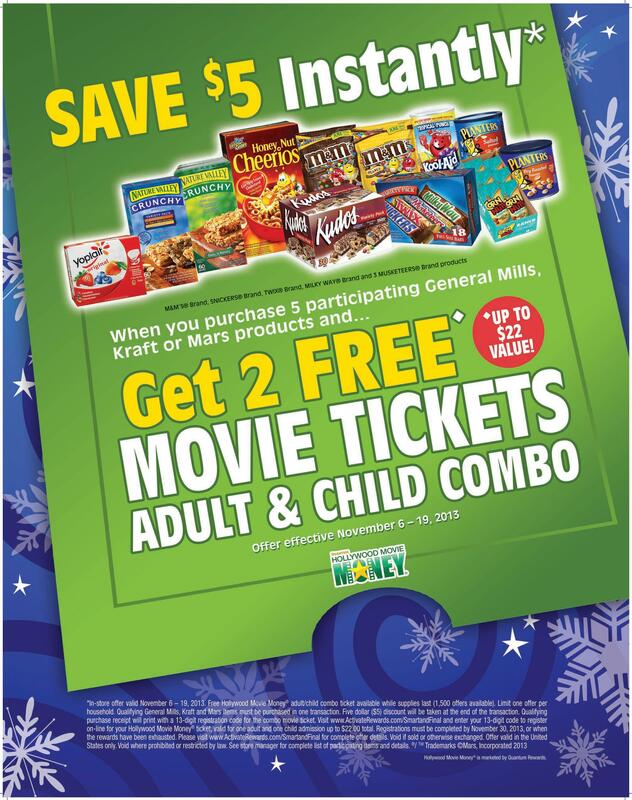 Save $5 when you buy 5 select General Mills, Mars, and other products (like the cereal, drink powders, and candy bars used in my recipes), AND get free Adult-Child movie passes! Trying to figure out what’s for dinner tonight? 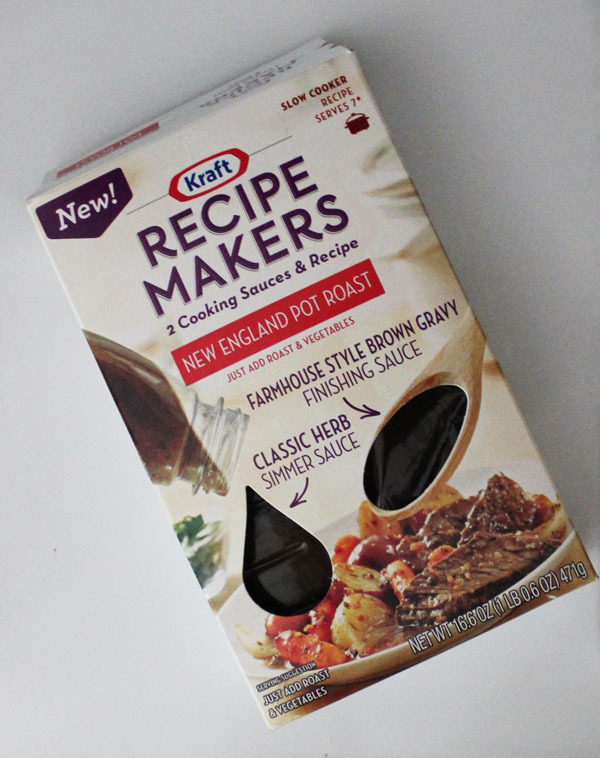 When I was asked to whip up a recipe with the new Kraft Recipe Makers, I knew I wanted to make a casserole. With school starting, I love making casseroles on the weekends – great for re-heating later in the week for a quick lunch for me or my husband, or a fast dinner as I’m trying to get the kids to bed to get a good night of sleep before school starts the next day. 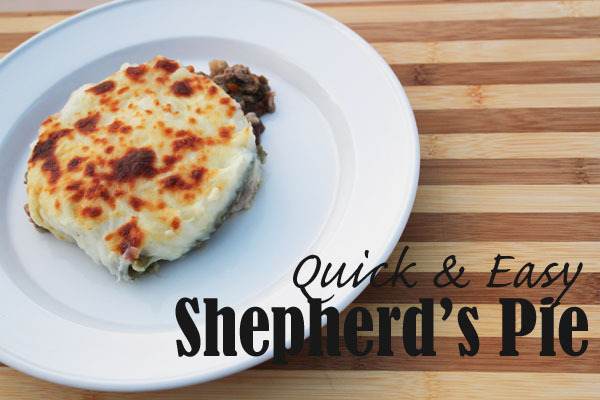 Shepherd’s Pie is one of our favorite go-to recipes. It is the best easy meal to whip together, and making it with Kraft Recipe Makers adds a whole new level of flavor! Brown the ground turkey. 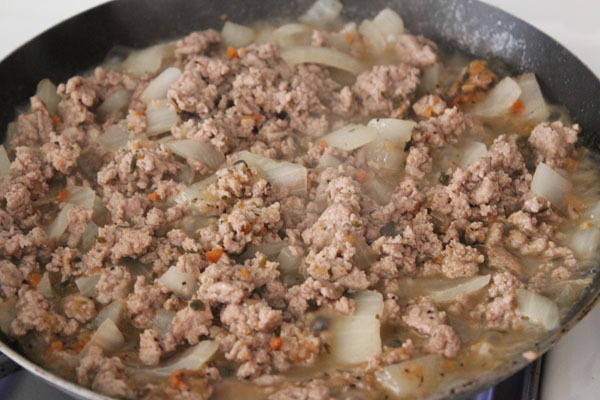 If you are adding onion, rough-chop the onion into 1/2″ cubes and add to ground turkey as you brown it. Once the turkey is browned, add the Simmer Sauce from the Kraft Recipe Makers. Let simmer for 5 minutes as you open and drain the can of green beans and get the mashed potatoes ready. In a 7×9″ casserole dish, build the casserole. First add the ground turkey, then the green beans. Open up the second packet from the Kraft Recipe Makers – the gravy – and pour over the green beans. Carefully spread the mashed potatoes over the top and sprinkle with cheese. Bake in a 350 degree oven for 20 minutes or until the casserole is warm through and the cheese is melted and toasty. Allow to cool a little, then serve! Yum! I love that Kraft Recipe makers includes all the flavor I needed to make one of our favorite dishes. It made dinner so easy to whip together! You can learn more about Kraft Recipe Makers on the Kraft website or Facebook page. If you’ve ever taken the time to frost a beautiful cake, you dread the time that it will be chopped up. 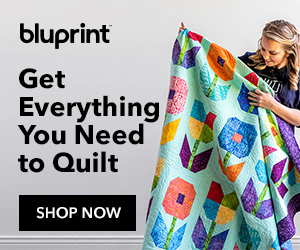 Sure, you want your guests to enjoy a bite of cake, and you know that dismantling your work of art is part of the process, but seeing all your hard work hacked to crumbs and pieces might make you die a little inside. Instead of attacking your cake with a knife, use a spool of thread for beautiful, clean lines that you might not even notice after cutting! 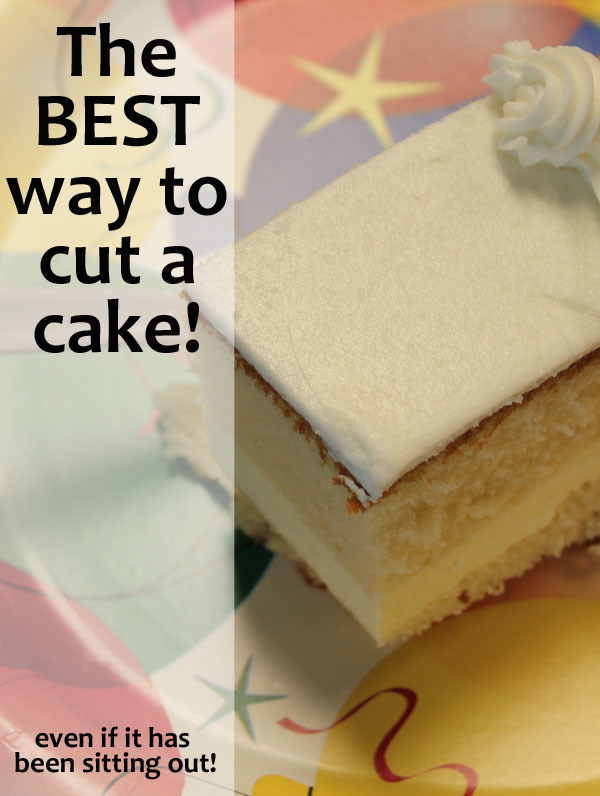 This trick even works on cakes that have been out of the refrigerator for a few hours, with frosting that is a little soft, and cake that is no longer firm. 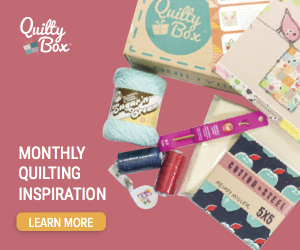 Grab a spool of thread. Hold the spool in one hand, and the end of the thread in the other. 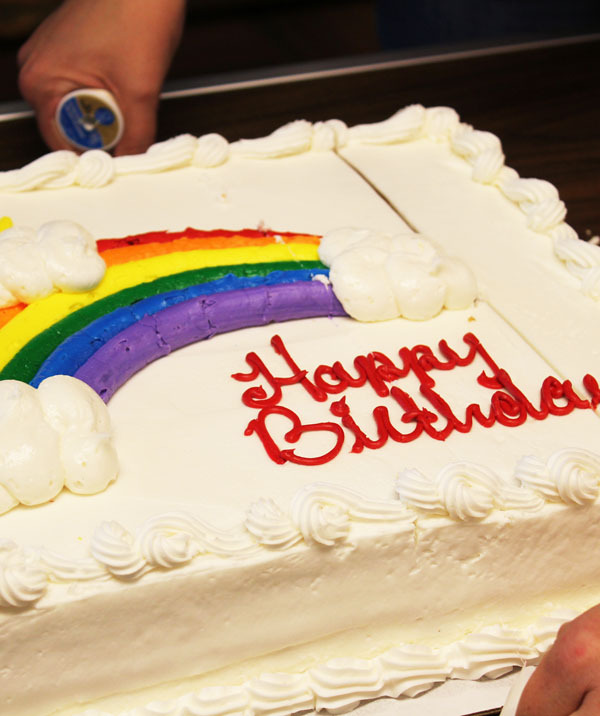 Pull your hands apart so that they are a few inches wider than the with of the cake. With the thread tight, pull the thread straight down over the cake. This will make a clean cut. At the bottom, make sure that the thread reaches all the way down to the cake board (or plate if that is what the cake is sitting on), and pull tight to make sure you have cut cleanly through the whole cake. Release the thread end, and holding on to the spool, pull the thread out. 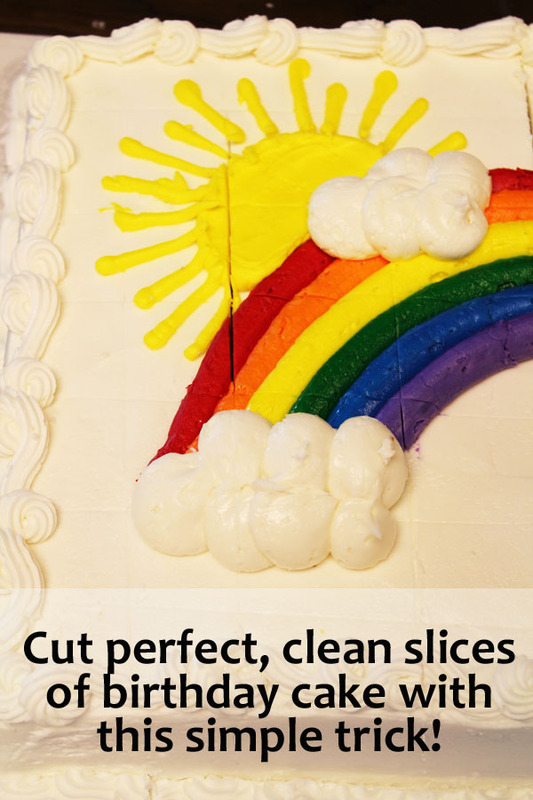 Repeat the process across the length and width of the cake to cut all of the slices. 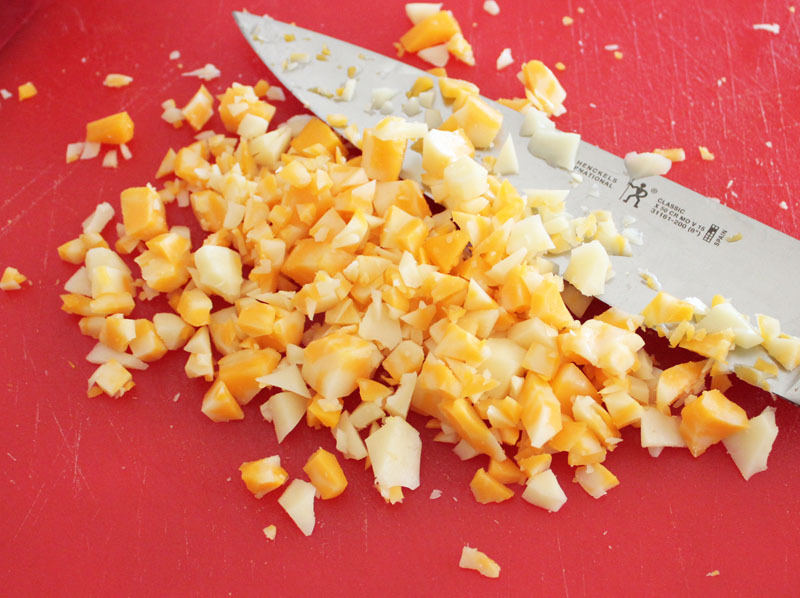 Then serve your beautifully cut pieces! I was at a party, and there was a bunch of cubed cheese left over afterwards. The hostess couldn’t eat it, so she asked if I could take it home. 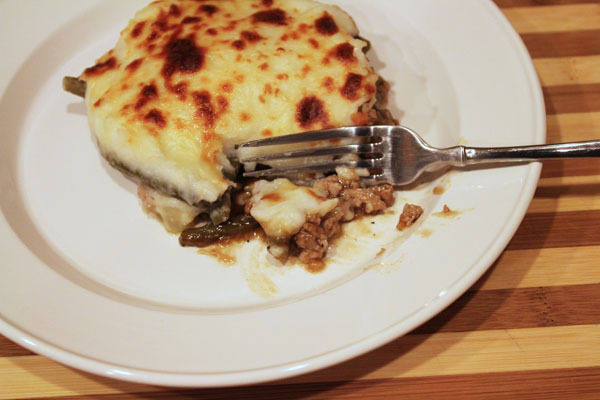 I knew that I could turn that cheese into a yummy dinner… and it really was delicious! Update: I hope you like this easy, affordable recipe! Between April 25 – May 25, 2014 a donation of just $40 will help the Beckstrand Cancer Association feed a family coping with cancer for an entire week! Click HERE to make your donation. Here is the Mac and Cheese Recipe I used. Boil water and add macaroni noodles. Cook according to package directions and drain. While the noodles are cooking, preheat oven to 400 degrees and chop up the cheese so it is as thin as if you had shredded it. Melt the butter in a saucepan. Add the flour, salt, and pepper and whisk. Once the flour/butter/spice mixture is mixed, slowly pour in the milk. Keep stirring as you pour to keep everything lump-free. Bring the pot up to a boil, stirring the whole time, and cook for 2 minutes. Lower the heat and keep cooking for about 10 minutes. Start adding the cheese, incorporating a little at a time. Let the mixture cook for another 5 minutes. Keep stirring, making sure to stir up the bottom to prevent burning. Add the cheese sauce to the macaroni noodles and mix well so that the noodles are fully covered. Pour into a greased baking dish. Melt the remaining butter and toss the breadcrumbs in it. Sprinkle over the top of the macaroni. Bake uncovered for 20 minutes until top is golden and yummy. 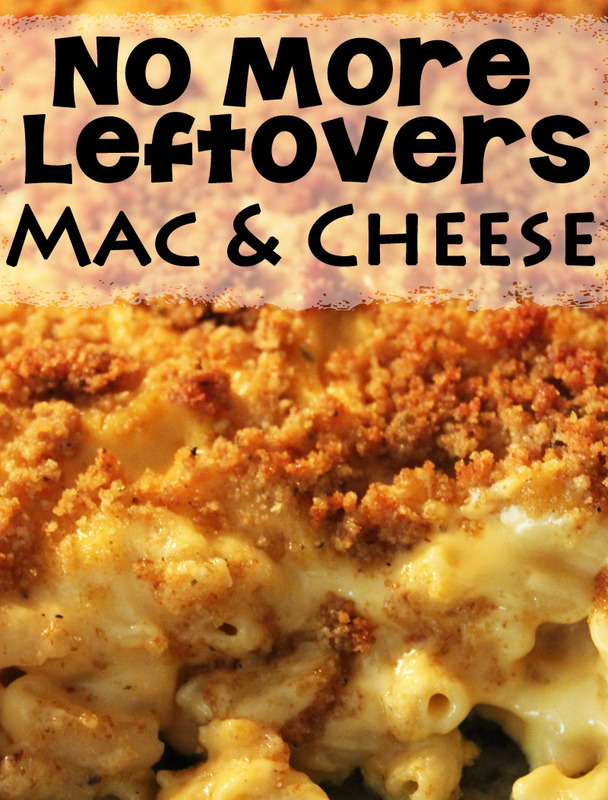 This is the best Mac and Cheese Recipe ever… and to think that it was made using leftovers! YUM!